Sometimes one has the perfect picture for a presentation that seems to be crooked or needs to be rotated to correct its alignment. At other moments, one might simply want to rotate an image to present a different perspective before an audience. Luckily, you need not to waste time using an image editor to rotate an image, as this can be easily done from within PowerPoint. 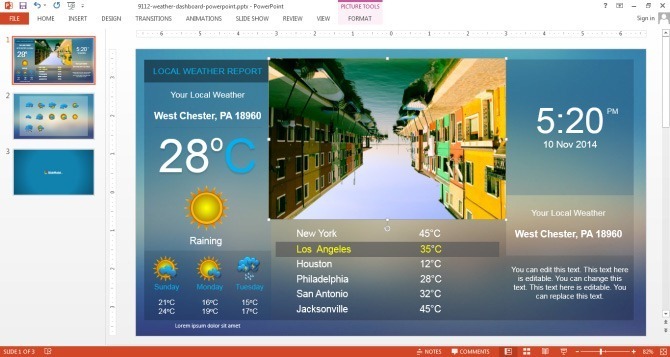 To demonstrate the process we added an image to the Weather Report Dashboard Template for PowerPoint. 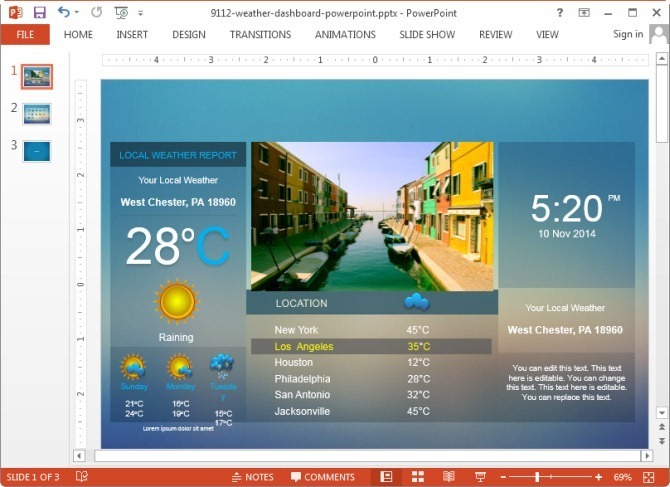 Let’s say you wish to present the weather outlook for a coming trip to your boss or want to present a presentation about the weather, environment or have a forecast to present which might affect the supply of goods. In such a case adding a relevant image might make your presentation that much more effective. As you can see from the below screenshot, the image needs to be rotated to fix its alignment. 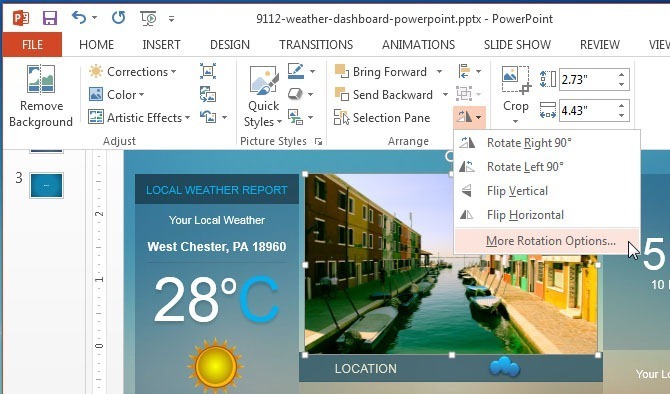 To get started with rotating a picture in PowerPoint 2013 you will have to click the image on your slide and go to the Format tab and click Rotate. 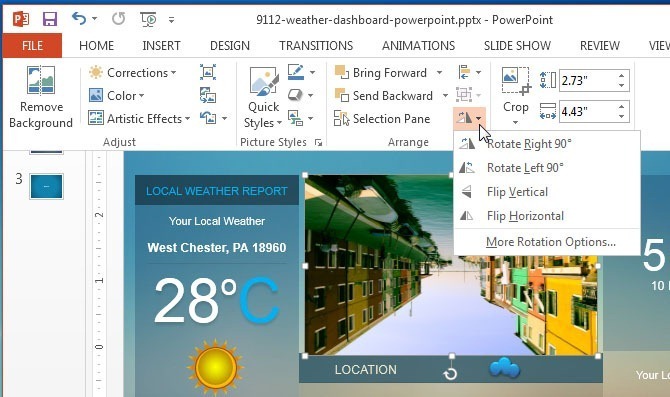 This will present you with a drop down menu with rotation options which will allow you to rotate the image 90 degrees in all four directions, i.e. vertically, horizontally, to the left and the right. Pick a direction that fixes the alignment of the image. You will be given a preview when you hover your mouse over each option. 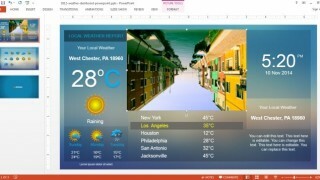 The below image shows the rotated image after we horizontally aligned it in PowerPoint 2013. Of course, your alignment requirements might not be merely covered using the four basic options, hence, you can opt for More Rotation Options to rotate your image according to more specific parameters. These advanced rotation options will display a menu from where you can configure the height and width of the picture, scale the picture, set a custom rotation angle, as well as set a desired height and width for your image. This menu also provides options to lock the aspect ratio, set a position for the inserted image and to reset it. Other options in this menu can also allow you to align your textbox and to set an Alt text title and description. Tip: You can make use of templates that allow inserting one or more images or sections to better accommodate large chunks of data like charts, tables, diagrams, etc. Using such slide designs can be helpful in reducing the number of slides in a presentation and help you easily focus on important information. 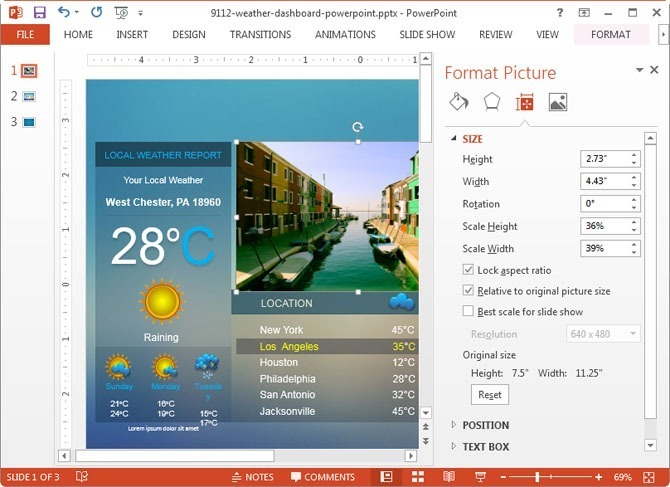 If you would like to download Premium PowerPoint Templates which can help you accommodate wide range of content in a single slide, then check out these Dashboard PowerPoint Templates.